This post contains spoilers for Stranger Things Season 2 and discusses Episode 7 in detail. "The Lost Sister" starts like a normal episode of Stranger Things. Eleven, the show's breakout star, is digging into the secrets of her birth, going through the files of other missing children, and trying to find her place in the world. But after the credits hit and the telekinetic teen hops on a bus leaving Hawkins, Indiana, it becomes clear that the seventh chapter of the sci-fi series' second season is going to be a detour from the main plot. The Chicago set story, which centers around the budding relationship between Eleven and Linnea Berthelsen's "Eight" aka Kali, ends up being the strangest -- and most surprising -- episode in the show's brief history. Unsurprisingly, the fan reactions have been divisive, with some viewers enjoying the change of pace and others rejecting Eleven's adventures in the Windy City. Reviews have for the most part been dismissive: Vanity Fair called it "a missed opportunity"; GQ dubbed it "the one Stranger Things episode you can -- and probably should -- skip;" and Vulture declared "there is absolutely no reason this episode had to be made." For a show where individual episodes often blend into one another, "The Lost Sister," penned by Justin Doble and directed by Rebecca Thomas, stands out. It's proven to be so immediately controversial that the show's creators, The Duffer Brothers, are already in damage control mode. "Whether it works for people or not, it allows us to experiment a little bit," Matt Duffer told Entertainment Weekly during a recent interview. “It’s important for Ross and I to try stuff and not feel like we’re doing the same thing over and over again. It’s almost like doing a whole little other pilot episode in the middle of your season, which is kind of a crazy thing to do. But it was really fun to write and cast and work on." Whether or not you agree with Duffer's defense, he's right about one thing: "The Lost Sister" does feel like a pilot episode. In fact, more than anything, it resembles what is commonly called a "backdoor pilot," an episode of an ongoing television series which introduces a wide array of new characters, a new setting, and a new tonal approach in the hopes that it will be warmly received by audiences and lead to a spinoff. Recent examples of the backdoor pilot include "The Farm," an episode of The Office that zeroed in on the popular character Dwight Schrute's wacky family, and "Valley Girls," an attempt to examine the California childhood of Gossip Girl's Lily. Neither of those episodes became full-fledged series. While the method has mostly fallen out of favor in the era of peak-TV -- spin-offs like Better Call Saul still happen but they're not often rolled into the pre-existing show -- "The Lost Sister" shares many stylistic qualities with old-fashioned backdoor pilots. (No such spin-off has been announced and the Duffers have not discussed one in recent interviews.) 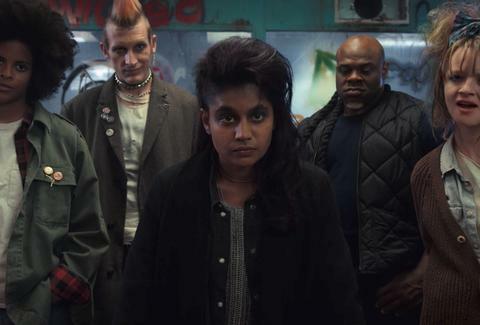 Like many backdoor pilots, it takes a beloved character (Eleven) and places them in an unfamiliar milieu (an underground gang of outcast street punks). It tells a self-contained story about Eleven's realization that Hawkins is her real home, but also leaves multiple loose ends and mysteries. For example, when is the sneering, mohawk dude Axe going to stop sneering all the time? Plus, as with any Stranger Things episode, the hour is packed with references to other films, television shows, albums, and cultural ephemera of the era. In the same way the show views suburban life through a self-consciously retro lens of refried Steven Spielberg, it imagines urban life as a Reagan-era cartoon of leather-jacket-sporting renegades, boombox-carrying partygoers, and suit-wearing mouth-breathers ripped out of an Oliver Stone movie. As is often the case with the show, the mining of familiar tropes and stock images of '80s life is so shameless that it almost feels like parody. Bon Jovi's "Runaway" blasting on the soundtrack doesn't help. But there's also reckless spirit to the episode that makes it work -- and Eleven's arc in the episode is poignant in a way that the previous episodes often aren't. Watching Millie Bobby Brown pull a train car with telekinesis as she's egged on by Kali, the purple-haired patient we caught a glimpse of in the opening of "Chapter One," has a pulpy charge that taps into the character's justifiable rage, anger, and resentment. It's raw. Again, the Duffer Brothers make a point to steal from only the most obvious source material, giving their hero a "control your powers" scene echoes the Yoda and Luke training sequence from Empire Strikes Back. And like the headstrong young Jedi, the newly stylish version of Eleven must leave Dagobah -- err, I mean, Chicago -- to rescue her friends. The episode also has something else going for it: It's short. At 42 minutes, it has the brisk pacing of a network drama, feeling less like yet another "chapter" in a long movie and more like a stand-alone episode of an action drama like Buffy the Vampire Slayer, Dark Angel, or even Lost. It may not do all the normal things that we now expect a Stranger Things episode to do, but it does expand the narrative parameters of what the show can be. If the Duffer Brothers have the intention of pushing the show beyond three seasons, they will need to find ways to make the existential threats of the Upside Down feel more than metaphorical. "The Lost Sister" is an awkward step in the right direction. Given the tepid critical reaction to the episode, it's unlikely that Netflix executives are greenlighting a X-Men-like spin-off series right away, but don't expect Kali to go away. As Vanity Fair points out, she's named for the Hindu goddess known for being the "destroyer of worlds." The violent, jaded mentor and hopeful, naive mentee relationship explored in the "The Lost Sister" is a familiar dynamic to genre fans. Think of Magneto and Charles Xavier -- or Buffy and Faith. Kali might not get her own show, but it looks like she's not done invading this one.